If it was only acceptable to have apple pie for breakfast. Even if it were acceptable, it isn’t exactly healthy, and we all need to make sure our breakfast is just as nutritious as it is delicious. 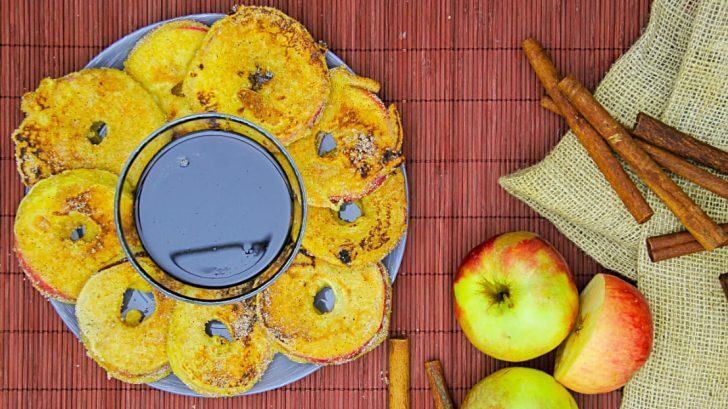 Instead of a stack of boring pancakes for breakfast, let’s take some tips from that slice of apple pie and make these apple pancake dippers: a ton of the same flavors, in a convenient little package. Luckily these little dippers are super simple to make. That, and it’s way healthier than a slice of pie, but just as delicious. Start by slicing your apples into rounds, using a melon baller to scoop out the seeds in the middle and making little rings. Prepare a batch of pancake batter, adding a teaspoon of cinnamon for flavor. Once that’s all mixed together, dip your apple rings into the batter. Spray a pan with some cooking spray, then cook the rings like you would a pancake. Once cooked, dip them in cinnamon sugar, then serve them alongside some maple syrup! This delicious breakfast treat is like a stack of pancakes but a million times better. It’s like a healthier apple pie! What’s not to love? Give them a try and you’ll be a believer in serving this amazing breakfast every chance you get!